Polygeneration Solutions: Devices allowing leaps in efficiency and impact reduction. We generate electricity most efficiently when we capture and reuse thermal energy and carbon dioxide in the process. Cogeneration facilities provide high voltage electricity and thermal energy. Trigeneration facilities provide high voltage electricity, heating and cooling, and hot potable water. Quadgeneration performs the same functions but also captures CO2 in the process for industrial reuse or sequestration. Increasingly smaller generation alternatives are becoming available, but they can pose issues with thermal energy loss. These are all forms of polygeneration solutions. The choice depends on the degree to which the user can employ thermal energy. Closet sized polygeneration units, installed within or around modestly sized and energy efficient mixed use structures (16-25 residents & 1-2 Businesses), currently appear to be the most viable and scalable option. 1. Compatible with the direct municipal delivery of properly procured natural gas. 2. Generation capacity of up to 30 people at 500 watts of daily electricity per person. 3. Designed to be located near the structure(s) served in a closet-sized enclosure which is protected from the elements. 4. Makes efficient use of byproducts including waste heat and CO2. 5. Ability to adapt to clean renewable energy sources as they become economically and technologically viable. 6. Scalable as needed to reduce the costs of acquisition, maintenance, and repair. 7. Affordable, with a cost of less than $50,000 per unit. PowerPoint (Jackson 2011) presents the assumptions used to size a district level genset for NewVistas and includes potential gensets along with the current baseline unit. The model initially called for a district level generator. Recent developments in microturbine technology now make it possible for each NewVistas to have a polygenerator. Video (Technigeek) demonstrating a micro turbine in development which promises to be extremely quiet and environmently friendly, while costing only a few thousand dollars. If proven effective, this could potentially power a NewVistas standard building based on anticipated consumption. 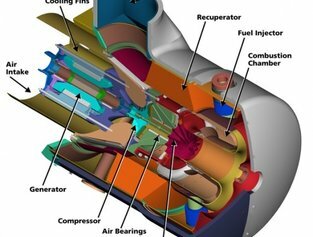 Wikipedia article discusses the benefits, applications, operations, and maintenance of cogeneration systems. It also discusses the amount of CO2, NOx and SOx that is emitted from the use of some particular machines. Website argues that smart microgrids are the most rapid and efficient way to achieve reliable, clean electricity service. Website devoted to explaining smartgrid technology and benefits.